July 10, 2011 - Sikorsky Aircraft announced the delivery of the 300th UH-60M Black Hawk helicopter to the U.S. Army. "The war-fighter has provided outstanding reviews of the UH-60M Black Hawk helicopter’s performance in theater,” said Lt. Col. Heyward Wright, Product Manager, representing Col. Thomas Todd of the U.S. Army's Utility Helicopters Project Office. "In my estimation, the UH-60M aircraft sets the standard for a successful utility platform in a combat environment." The UH-60 Black Hawk is a four-bladed, twin-engine, medium-lift utility helicopter manufactured by Sikorsky Aircraft. Sikorsky submitted the S-70 design for the United States Army's Utility Tactical Transport Aircraft System (UTTAS) competition in 1972. The Army designated the prototype as the YUH-60A and selected the Black Hawk as the winner of the program in 1976, after a fly-off competition with the Boeing Vertol YUH-61. The UH-60A entered service with the Army in 1979, to replace the Bell UH-1 Iroquois as the Army's tactical transport helicopter. 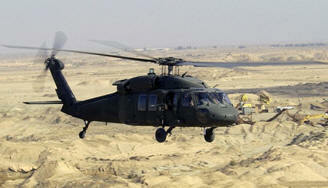 This was followed by the fielding of electronic warfare and special operations variants of the Black Hawk. Improved UH-60L and UH-60M utility variants have also been developed. Modified versions have also been developed for the U.S. Navy and U.S. Air Force. In addition to U.S. Army use, the UH-60 family has been exported to several nations. Black Hawks have served in combat during conflicts in Grenada, Panama, Iraq, Somalia, the Balkans, Afghanistan, and other areas in the Middle East.